Elderly Pneumonia FAQ: Learn the Signs and Risks for Boulder-Broomfield Seniors | BrightStar Care " "
If you help care for your aging Boulder-Broomfield senior parent, then you’ve probably heard the importance of taking preventative measures against pneumonia. That’s because seniors are much more prone to catching the illness. In fact, according to a 2009 study, the annual incidence of pneumonia among adults over 65 is four times that of younger populations. Read our FAQs to learn why and get tips to identify pneumonia symptoms and ensure a speedy recovery for your parent. As we age, our lung capacity shrinks. This makes it harder to cough up sputum, the mucus our lungs secrete in order to clear infections. By consequence, infections can fester among older Boulder-Broomfield senior adults and, worse, the mucus may accumulate in the bronchial tubes, preventing oxygen from entering the blood and cells of the body. 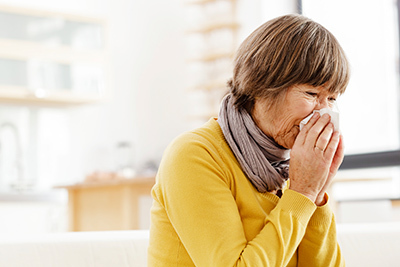 Residing in an assisted living community or nursing home puts your Boulder-Broomfield senior parent at greater risk of contracting pneumonia due to the close proximity of potentially infected residents, visitors, and workers. This is known as community-acquired pneumonia (CAP). However, as noted above, symptoms may go unnoticed in a Boulder-Broomfield senior who might experience these conditions on a normal, healthy day. "The symptoms and signs are sometimes not as specific,” says Dr. Joseph Mylotte, a professor of medicine at the School of Medicine and Biomedical Sciences at the University of Buffalo, (via A Place for Mom). “They may be more sleepy and lethargic, or lose their appetites, or they may suffer from dizziness and fall." There are a few special considerations to make when prescribing an antibiotic to a Boulder-Broomfield senior. As we age, the ability to metabolize medications changes, and so older adults can become more sensitive to dosage and susceptible to upset stomach. Further, many seniors already take a cocktail of medicines, increasing the risk of potential negative interactions when adding any new medicine. Your parent’s doctor should take these factors into consideration, but it never hurts to do your own research on safe medication management. To help your Boulder-Broomfield senior parent feel more comfortable, you can give him or her over-the-counter medicines for fever and chills. Exercise caution with cough medicines, however, as coughing helps expel mucus to rid the lungs of the infection. You don’t want to suppress coughing entirely, but if it’s keeping your parent up at night, you can get a cough suppressant prescription.